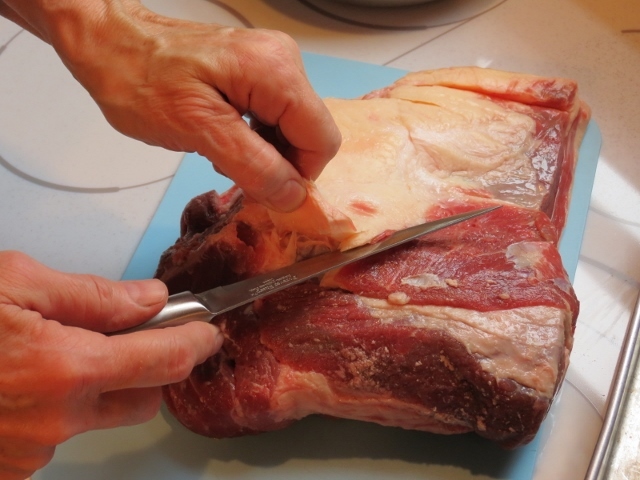 Today I’m going to teach you how you can make your very own corned beef brisket at home. This is a very easy process and involves quite a bit of waiting, but not much actual work. If you’re like me, that criteria always moves a project to the top of my list. Start with a Pasture Nectar Farm grass-fed beef brisket. I always have our briskets cut in half, so they’re a manageable size, around 4 lbs. or so. I’m going to share the recipe I use, adapted from The Complete Make-Ahead Cookbook. While I normally avoid added nitrites in meats, I make an exception for this exceptionally tender family favorite. Starting with a flat brisket is best. The one I’m using here is a bit rounded, but I’m saving the flatter ones for you to try. Pink curing salt #1. This is a combination of table salt and nitrites. You can purchase it online or in specialty stores. It is also called Prague Powder #1 among other things. A large Dutch oven or stock pot that can hold 7 quarts or more, and a plate that can just fit inside the pot. I use the stock pot to brine in, and a Dutch oven to cook it in since I happen to have both. Cheesecloth and something to tie it with like kitchen twine. Salt: I like to use Morton’s Kosher salt for this, but I increase to 1-1/8 c instead of the 3/4 c. regular salt listed. Plan ahead! This recipe happens in 2 steps: curing the brisket which takes 6 days, and the final cooking when you get to add the traditional cabbage and potatoes on the day you’re going to eat it. NOTE: you can do the 6-day curing part, cook the meat through Step 3 below, and then refrigerate the brisket for up to 3 more days prior to reheating and cooking the vegetables. Save the liquid!! NOTE; While these are traditional veggies for corned beef, if you have picky eaters or just want a different twist from boiled fare, roast them instead! Cut any vegetables you want into small pieces, mix with oil, salt and pepper, then roast in a single layer (not touching as much as possible) at 425 degrees for 15 minutes to start. The edges should be crispy. If there isn’t enough room around the pieces, it will steam them instead. Use two pans if you need more room. Trim the fat to 1/8 inch. You want the salts to be able to reach the innermost parts of the meat. Dissolve salt, sugar and curing salt in 4 quarts water in your container. Add the brisket, 3 garlic cloves, 4 bay leaves, all of the allspice berries, 1 tablespoon of peppercorns, and all of the coriander seeds. 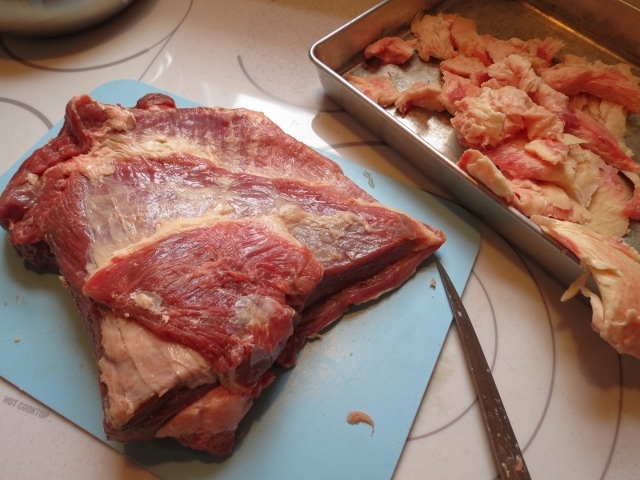 Use your plate to submerge the brisket (leave the plate in there), cover, and refrigerate for 6 days. On the 7th day, put your rack in the middle position and heat oven to 275 degrees. Remove the brisket from the brine, rinse, and pat dry. Cut an 8-inch square triple thickness of cheesecloth. Now take the remaining spices (3 garlic cloves, 2 bay leaves, and 1 tablespoon peppercorns), place in the middle of the layers of cheesecloth, and tie it in a bundle with twine. Put the brisket, the spice bundle and 2 quarts of water in a Dutch oven or stock pot. The brisket might not lay flat, but it will shrink as it cooks. Bring to a simmer over high heat, then cover and transfer to the pre-heated oven. Cook until the meat is tender and a fork slips easily in and out of the meat, approx 2-1/2 to 3 hours. Remove from the oven, and transfer the brisket to a large platter, ladle a cup of cooking liquid over the meat, and return to the oven to keep warm. Turn off the oven! Add the carrots and potatoes to the pot and bring to a simmer over high heat. Reduce to medium-low, cover, and simmer until vegetables begin to soften, about 7 to 10 minutes. Add the cabbage to the pot, increase the heat to high, and return it to a simmer. Now reduce the heat to low, cover again, and simmer until all the vegetables are tender, 12 to 15 minutes. While the veggies are cooking, you can transfer the brisket to a cutting board and slice against the grain into 1/4-inch thick pieces. Slicing against the grain of meat makes it more tender to chew. Yes, it’s a thing. Return the beef to the platter. Transfer the vegetables to the platter using a slotted spoon, and moisten all with additional broth. If you refrigerated the brisket after you cooked it through Step 3, you can slice it now, place in a 13x9 baking dish, pour 1 cup of the liquid over the meat, cover with foil, and reheat it in a 350-degree oven for 30 minutes. Bring the remaining cooking liquid to a simmer and continue on with the vegetable part above, or roast your vegetables instead. I hope you enjoy this traditional dish as much as we do! What St. Patrick’s Day or spring traditions does your family enjoy? Share with us in the comments!